Life After “Cool Church?” A New Vision for Youth Ministry, Part 2. If you have been following this conversation feel free to scroll down and begin reading at “What we could do instead?” In case you are just joining the conversation, this post begins with an introduction to the problem: The current “relevant” youth ministry model has led to the abandonment of the church by 20-somethings. Twenty Five years ago Stuart Cummings-Bond predicted in a Youthworker Journal article (1989) that ghettoizing youth away from the rest of the church would have disastrous results. He called it “the one-eared Mickey Mouse.” Today we see the fruit of this model in the abandonment of the church by twenty-somethings. Will we do things differently for the next generation arriving to our programs? Or is it ok with us that young people leave the church when they leave our student ministries? Churches continue to invest heavily in youth ministries that are parallel to and “cooler” than the adult church – The youth pastor’s vision of what the big church could become. This model gave us the youth service as a place of evangelism for the young and learning lab for the larger church. In this model, the larger church first opposes then ignores the “radical” things happening in the youth room. At least for a time. That time typically ends when we call a new pastor. Then the new pastor, invariably a former youth pastor who learned attractional ministry in the youth room, redesigns the main sanctuary and re-packages the worship model to resemble what he was doing in the youth group a decade earlier…only with a larger budget and fully-functioning coffee house. Has it occurred to you how remarkably similar your new sanctuary looks to your old youth room? Similar decor, similar music, similar technology, similar dress, identical message. Why did we do this? Because it built fast numbers. 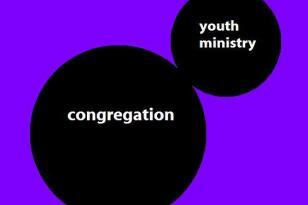 Segregationist youth ministry is pragmatism at its worst. We used to be able to say, “Well it is working. God is using it, so who are you to judge?” However, the data has piled up: Cummings-Bond was right. Segregationist student ministry is a short-term, non-solution that threatens the very future of the evangelical church movement. Research tells us that by segregating students into homogenous age groupings we are emptying our churches. What if instead of giving students what we think they want, we gave them what they need: A praying, confessing, Scripturally faithful, Father trusting, Jesus following, Spirit surrendered, faith-practicing community that wants to help them get their hands dirty for God? A. God: Shift from self-centered (God for you) to God-centered (“God. I. We. They”). God is our starting point. It is God who is Glorious and worthy of all praise. Salvation is at God’s initiation and at God’s Expense. We are welcomed into God’s family…the community through which God’s realm will be revealed. Our welcome of others comes from God’s welcome of us and should always result in a passion to serve a lost and hurting world. We start with God and move toward the world. Our calling from God drives us in mission rather than the world’s need. Segregated ministries–to-championing the church. Youth participate in every aspect of the church. When “big church” meets, the youth are there. Cultural relevance-to-Scriptural faithfulness.Why do we do what we do? If it is “because it works” rather than because it is Scripturally faithful, let it go. Student ministry-to-student development. This is about relationships: A life on a life, 7 day a week program. Is our first motivation to create high numbers or highly committed disciples? A group must be large enough to be a group, but what would happen if we grew by being the deepest thing rather than the widest thing? Does your youth ministry program toward developing those characteristics in students? Teach (parents, leaders, kids) the excitement of historic, life-changing faith in Christ. Use games & humor purposefully. *By all means, enjoy yourself in church. I am not saying faith is not enjoyable, just that it isn’t entertainment. Use the youth group experience to create environments where the energy is in the students experiencing God (vertical) and loving and challenging one-another (circularly) rather than toward the leadership on the platform (horizontally). After all, Even their teachers don’t spend the hour lecturing any more! « Why Blog? Because ideas engaged can catalyze change. I have been reading with interest these last few weeks as you have been thinking out loud. In fact I have also read most if not all of the comments. I think that you are on to some great ideas, and I commend your willingness to evaluate and refine. A few of the comments have started to open this door. I am not looking to hi-jack where you are headed in any sense. I think that we in the Church must also be willing to ask questions about the destination we want these young people to approach. You have started that with your comments about PhoenixOne. I know that you are feeling like segregation is part of the problem, and maybe it is, but at least as important an issue may be the total lack of transition into the “big church” adult world. I think that fits this discussion and deserves more thought. I’m not putting all that on you. Your work has gotten me thinking already. I am probably not alone. If that isn’t enough there are other issues relative to the destination. Here is a post that I like because it asks some of those questions. http://churchwhisperer.com/2009/06/23/preaching-is-up-so-why-isnt-the-church/. Part of raising future generations is being stewards of what we will someday hand off to them. Thanks for following the conversation. I am indeed thinking out loud and welcome others to think aloud with me…”iron sharpens iron” and all. I read the church whisperer’s post. Good stuff! Are you Blake? I agreed with the “whisperer” that preaching is not the end all. As someone who spent most of his church life in evangelical churches in which the entire service was really designed to lead up to, through and from the sermon, it now feels pretty flat. The ancient service of the Word, Service of the table format is so much richer. The historic elements of singing belief, public reading of Scripture and expositing it, affirming the historic faith in the creed, public confession, intentional reconciliation, and interceding on behalf of the world…there is just so much more there. In addition, the sacramental Lord’s table in which we both offer ourselves to God and receive him anew isn’t present, nor usually is the the sending forth into the world in service. It just has more meat. On the other hand, liturgical Christians tend to live off of that richness, which can give us some of the most dreadful preaching around. 🙂 Sometimes we stop believing the words or acting as if they matter, that then becomes dead form as well. I am not Blake. He is a good friend. He actually made me aware of your first post on this subject. You Probably saw that he also thinks out loud quite a bit. We also participate together on a blog called 5 Principles (5principles.net). That is not intended to be a commercial, but rather a chance for you to find out who we are and why we would be intrigued with people who are talking about the Body of Christ. I will be staying tuned to this discussion. I am really enjoying it. Looks like I am behind on the comments on the first post. I am actually a Phoenician. Who knows maybe someday we will have a cup of coffee. Just checked out 5 principles. Lots of interesting stuff there. Couldn’t help but notice the reference on “the Cure” post to Lynch, Thrall and McNicol. Do you live beer Open Door Fellowship? If so, we are in the same hood. That’s a pretty small world. We should get coffee because we are probably drinking in the same coffee houses. I do live in that area, but go to Royal Palms Baptist Church. I know several Open Door families. I don’t actually drink much literal coffee, But I am good at watching others do so while having ice tea of the like. I’ll go to your web site and send you an email with my contact information. Could you explain your comment about the “problem with parents engaging” and “parents tend not to follow their children to church”. I am a parent of 3 teens and 4 elementary aged kids. I’d like to make sure I am not one of those parents!! I’m finding your posts very thought provoking. I have read over the “New Vision for YM” post twice and can’t find either of those sentences. So I can’t actually remember what I said. 🙂 Could you give me a little more context to jog my memory. I am guessing that you have a very full life with 7 kids at home. Way to go finding time to read! I would even question the whole concept of a specialized youth minister. Isn’t this what started the ball rolling into an age-segregated church? What is wrong with the “regular” minister? Besides, once the youth minister hits a certain age, suddenly he looks to become a “regular” minister. Who came up with this idea that an older pastor can’t relate to youth? Thanks for weighing in. I have no issue with people specializing in group’s- just when their job is to get them out of the hair of the rest of the church. …and it probably goes without saying that someone need not be young, but they must “speak” young – as must any missionary must speak the language of the group they have been called to serve and engage. I sure enjoy your blog entries, and am eager to see where they go. I’m encouraged by your idea to integrate families, which is a return to how things have been done not a new and strange idea. Thank you for “thinking out loud”. It touches a nerve, and I’m sure responses will cover the regime from positive to defensive. St. Isaace the Syian once said “The knowledge of the cross is concealed in the sufferings of the cross” But there in suffering comes our salvation and joy, and courage to be real. I believe that is what young people in particular want and need, a sense of something real, something touched even if there’s sacrifice, and someone who can really hear another person face to face. What I would love to see is more discussion on the concept of true “exchange” and what I mean by that is represented in this question: “What does church affiliation do for me?” To start at the beginning, I was once told by a psychiatrist that children need to be raised with some form of “faith structure” so that they will have “something to stretch, test and trust” as they grow. Churches (or temples or synagogues or mosques or strip mall structures rented by members of some sort of faith) represent where society goes to meet the spirit: to celebrate an inner feeling of faith with an outer venue of community, to have births witnessed in baptism, to have deaths mourned and lives remembered, to have relationships (marriages) witnessed and celebrated, sanctuary can be offered for prayers and meditations, help and assistance can be provided to the outer community as a practice of compassion, etc. We all need places where FAITH can be part of our life’s mix of activities. THIS IS WHAT SHOULD BE AT THE BASIS OF THE MARKETING OF CHURCH TO ALL INDIVIDUALS, NOT JUST PARENTS OR KIDS and church membership–including the practice of putting some money into the venue–should be something held in similar value as police and fire stations, hospitals and the post office. Exchange, to get back to the opening salvo, is all about looping thought, practice, giving, receiving and celebrating all of it with a happy, open, trusting mind. In this way, churches will hold, carry and give back to communities of individuals all that is true, good and beautiful. And if I were queen, all this would be common sense reality across the world! Great thoughts, MLHE! Not many wanted to talk about that post when it came out. Many want to focus on the problems. Few want to talk about doing something to help it. Have you read James Smith’s “Imagining the Kingdom”? He makes the same analogy of the mall in the opening of his book. There is a guy posting on “Cool Church” yesterday about wanting to raise his son without a community of faith. I think he will find the need for a village when his son becomes a teen.